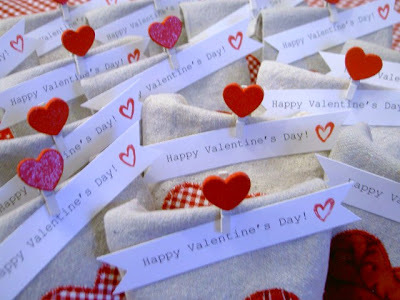 Drop cloth makes easy, inexpensive curtains but it’s also perfect for Valentine’s Day goody bags. Today I’ll show you how to make DIY drop cloth goody bags for your next party. 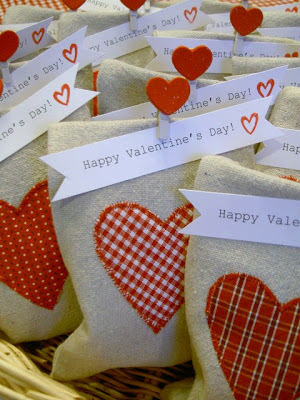 A DIY tutorial to make drop cloth goody bags for Valentine’s Day. 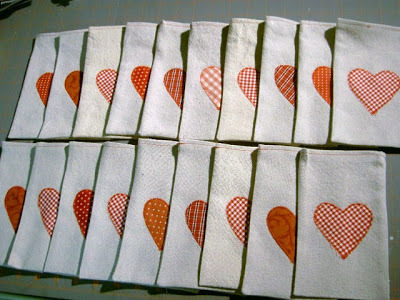 Use up those drop cloth scrap pieces and make a simple gift bag with appliquéd heart. The Valentine’s Day tradition still continues to this day especially at school where students are expected to bring in a valentine for each of their classmates. Typically this valentine is a candy treat, stickers, tattoos or other small trinket. I decided to make a special goody bag that’s reusable long after Valentine’s Day is over. 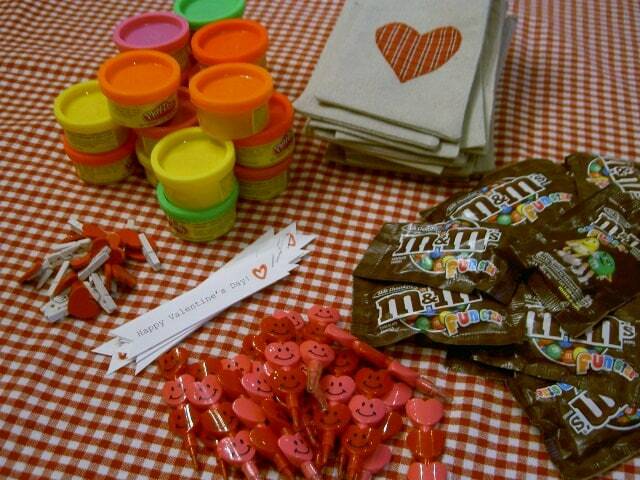 These drop cloth goody bags can be modified for any holiday or party theme. 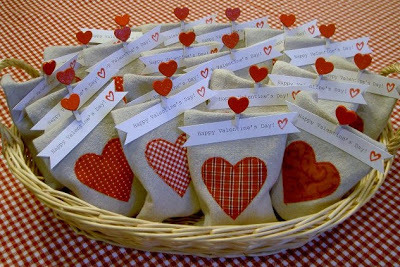 I filled them with treats and then closed the bag using a printed tag and a mini heart clip. 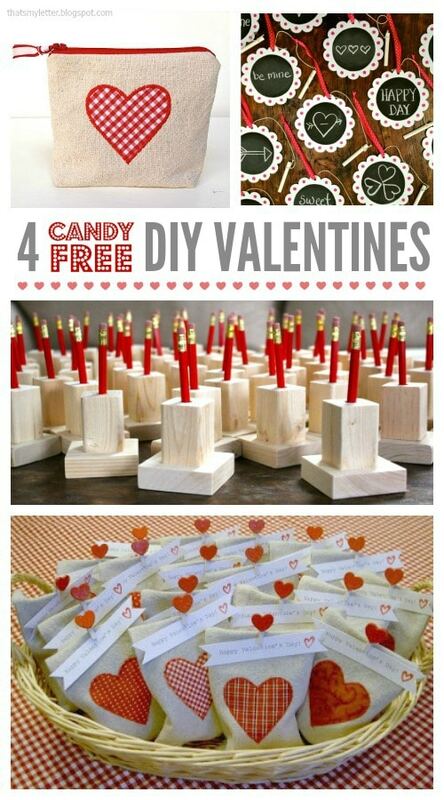 Such a fun valentine to give or perfect for your party favors. You can make the bags larger or smaller depending on your fillings. 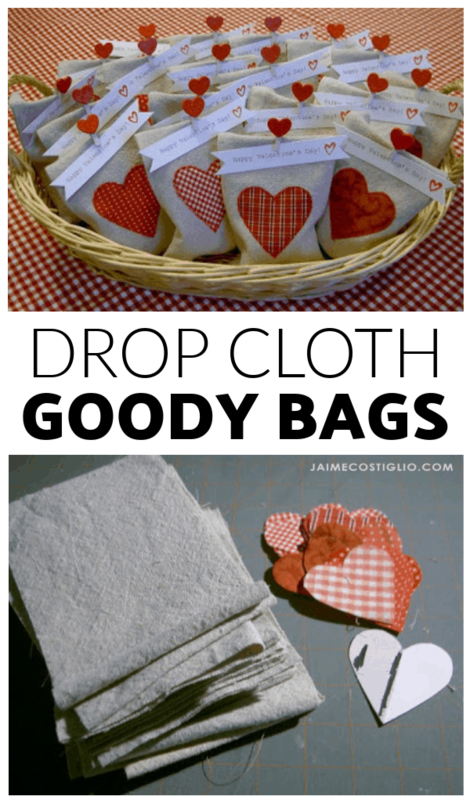 Below are the step by step instructions to make drop cloth goody bags. 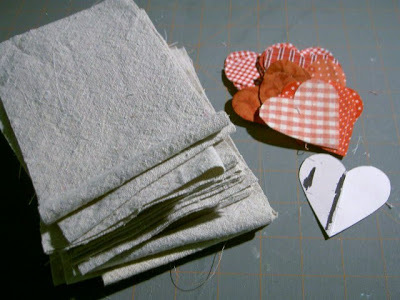 Step 1: Cut a rectangle shape from drop cloth about 5″ wide x 12″ l depending on the size needed for your treats. Print out a paper heart pattern and use as a template to trace and cut out red hearts from cotton fabric. 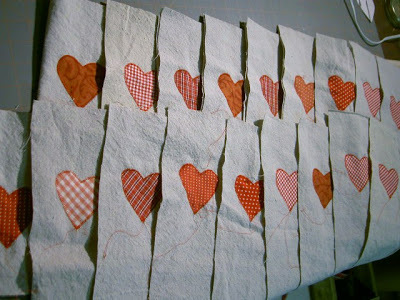 Step 2: Pin the red heart at center on the drop cloth then zig zag stitch around the edge to secure. Step 3: Fold the drop cloth rectangle in half right sides together and sew the side seams shut. Turn right side out. Step 4: Fold over the top raw edge and top stitch around the opening for a finished look. For the fillings I used playdough, heart crayons and M&Ms candy. 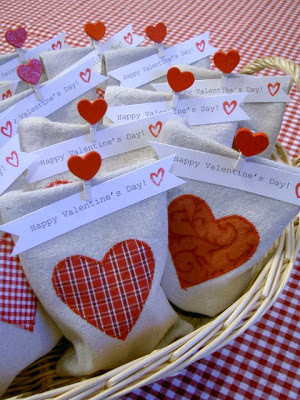 To keep the goody bags closed fold over the opening and secure using a mini heart clip with your note attached. I placed all the good bags in a low basket that is easy to access for little hands. 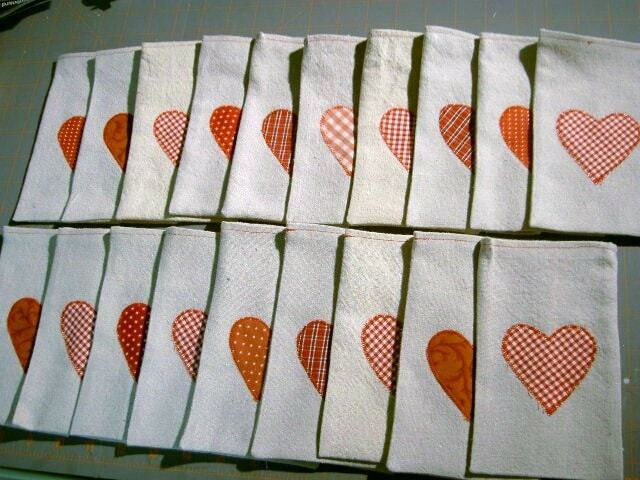 Ok, so Totally a New Follower, LOVE those sweet bags, YOU are the BEST mom… LOVE them. 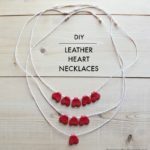 so happy to be a new followr of such Inspiration..
Oh my goodness-this is definitely the best Valentine craft I've seen this year! A.D.O.R.A.B.L.E!!! L-O-V-E This! So cute and I know they will be loved by all whom they are gifted too. Those are definitely keepers – so cute! Those are too cute! What a sweet mom you are! 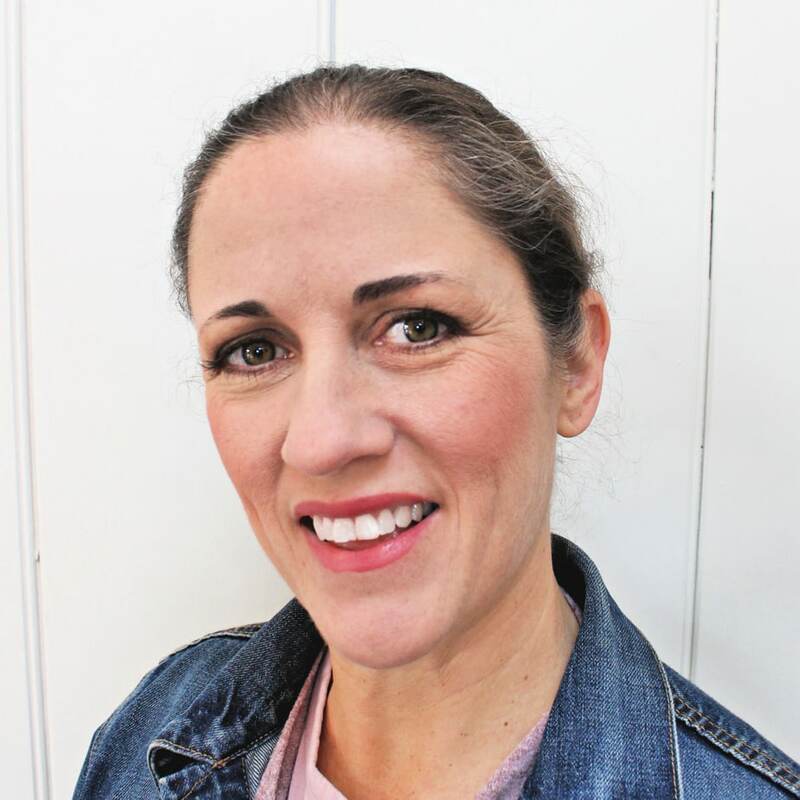 Thank God your babies aren't in my kids' class! You'd be making me look bad! HA! Really, really cute idea! Love it! Those are so stinkin' cute! 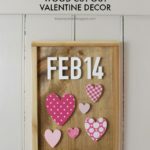 I especially love the little clothes pin heart clips! Visiting from CSI Link Party. Those are really cute! What a fun gift! 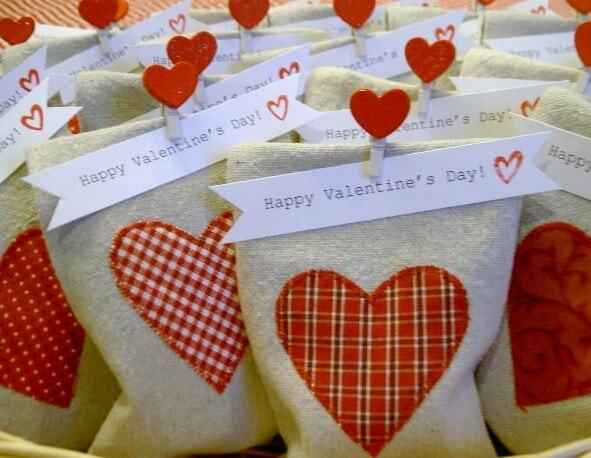 Those are the most adorable goody bags ever!! P.S. 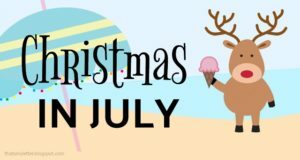 I'm sharing this on the Peppermint Plum Facebook page today. It's too awesome not to! Very cute! I may have to try something like this for my son's daycare class. Thanks for sharing! Ummm…these are FAB! I want to have a party so I can hand them out! So cute! 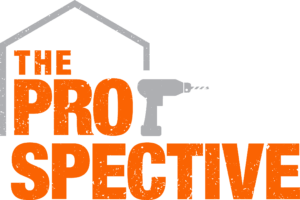 I have seen so many great ideas for using drop cloth lately..I'm definitely going to have to pick one up and try these out! Such a cute blog too…I am your newest follower! Hi! Visiting from the Valentine's Day Challenge at Life of Bliss. 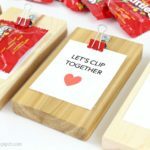 Love these goody bags – so cute! I vote for you! I heart these. My little girl's b-day party is on v-day. I'm thinking this is a super great idea for the goodie bags. Thanks for sharing!! This is absolutely ADORABLE!! 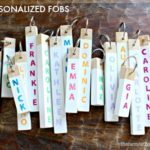 I'm putting together a section of crafts for LOVE month on my site … http://www.wikimommy.com … and I would love to feature this!! Please email me ro (at) wikimommy (dot) com and let me know if I may re-post this on my site. Thanks for sharing! !